This article is about the band. For their debut album, see Fine Young Cannibals (album). For the song by Wolf Parade, see At Mount Zoomer. For the 1960 film, see All the Fine Young Cannibals. David "Shuffle" Steele is an English musician who was a member of The Beat and Fine Young Cannibals. All the Fine Young Cannibals is a 1960 American film directed by Michael Anderson, based on the novel by Rosamond Marshall starring Robert Wagner, Natalie Wood, Susan Kohner, George Hamilton, and Pearl Bailey. Hamilton said it "combined Southern Gothic with a biopic of jazzman Chet Baker". Robert John Wagner Jr. is an American actor of stage, screen, and television, best known for starring in the television shows It Takes a Thief (1968–70), Switch (1975–78), and Hart to Hart (1979–84). He also had a recurring role as Teddy Leopold on the TV sitcom Two and a Half Men and has a recurring role as Anthony DiNozzo Sr. on the police procedural NCIS. The group was formed in 1984 after the dissolution of The Beat, with whom Cox and Steele previously played. The duo of Steele and Cox spent eight months listening to over 500 cassettes of potential singers before picking Gift. They had difficulty obtaining a record contract, but when a video of their song "Johnny Come Home" appeared on British TV show The Tube , recording contract offers flowed in immediately. The band's eponymous debut album was released in 1985, spawning two UK hit singles, "Johnny Come Home" and a cover of Elvis Presley's "Suspicious Minds" featuring additional vocals by Jimmy Somerville. These two songs also became hits internationally, charting in the top 40 in Europe, Canada and Australia, although they failed to make a significant impact on the US charts. The Beat (known in the United States and Canada as The English Beat and in Australia as The British Beat, are a band founded in Birmingham, England, in 1978. Its music fuses Latin, ska, pop, soul, reggae and punk rock. Fine Young Cannibals is the debut album released in 1985 by the band of the same name. The album features the UK #8 debut hit single "Johnny Come Home". Tin Men is a 1987 American comedy film written and directed by Barry Levinson, produced by Mark Johnson, and starring Richard Dreyfuss, Danny DeVito, and Barbara Hershey. In the gap between their first and second albums, Steele and Cox released an instrumental house single under the moniker "Two Men, a Drum Machine and a Trumpet" in 1987, called "Tired Of Getting Pushed Around", which reached No. 18 in the UK Singles Chart  and was popular on the U.S. dance chart. During this time, Gift appeared in the movie Sammy and Rosie Get Laid . House music is a genre of electronic dance music created by club DJs and music producers in Chicago in the early 1980s. Early house music was generally characterized by repetitive 4/4 beats, rhythms provided by drum machines, off-beat hi-hat cymbals, and synthesized basslines. While house displayed several characteristics similar to disco music, which preceded and influenced it, as both were DJ and record producer-created dance music, house was more electronic and minimalistic. The mechanical, repetitive rhythm of house was one of its main components. Many house compositions were instrumental, with no vocals; some had singing throughout the song with lyrics; and some had singing but no actual words. The UK Singles Chart is compiled by the Official Charts Company (OCC), on behalf of the British record industry, listing the top-selling singles in the United Kingdom, based upon physical sales, paid-for downloads and streaming. 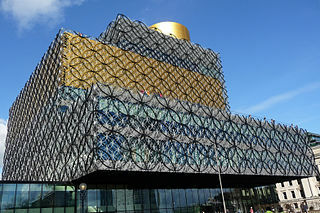 The Official Chart, broadcast on BBC Radio 1 and MTV, is the UK music industry's recognised official measure of singles and albums popularity because it is the most comprehensive research panel of its kind, today surveying over 15,000 retailers and digital services daily, capturing 99.9% of all singles consumed in Britain across the week, and over 98% of albums. To be eligible for the chart, a single is currently defined by the Official Charts Company (OCC) as either a 'single bundle' having no more than four tracks and not lasting longer than 25 minutes or one digital audio track not longer than 15 minutes with a minimum sale price of 40 pence. The rules have changed many times as technology has developed, the most notable being the inclusion of digital downloads in 2005 and streaming in July 2014. Sammy and Rosie Get Laid is a 1987 film directed by Stephen Frears, with a screenplay by Hanif Kureishi. The Raw & the Cooked is the second and final studio album by British rock band Fine Young Cannibals, released in 1989. The title of the album was lifted from the book of the same name by French anthropologist Claude Lévi-Strauss. Four songs from the album first appeared in film soundtracks in the mid-1980s, three of which were soul tracks from the Tin Men film. The band had already recorded over half of the album by the time David Z came to produce the remainder. His work with the band, which resulted in dance-rock material, included studio experimentation. In 1990, the band contributed a cover version of Cole Porter's song "Love for Sale" for the album Red Hot + Blue produced by the Red Hot Organization, a collection of 20 Cole Porter songs recorded by various artists as a benefit for AIDS research. Fine Young Cannibals disbanded in 1992, although they briefly returned to the studio in 1996 to record a new single, "The Flame", which would complement their greatest hits compilation The Finest released that year. In the early 2000s, Gift (without Steele or Cox) reactivated the band name and toured as Roland Gift and the Fine Young Cannibals. Amanda Meta Marshall is a Canadian pop-rock singer. She has released three studio albums, the first was certified Diamond in Canada, with the latter two certified 3x Platinum and Platinum respectively. She is best known for her 1996 single, "Birmingham", which reached number 3 in Canada and was her only song to reach the US charts. Transvision Vamp were a British alternative rock group. Formed in 1986 by Nick Christian Sayer and Wendy James, the band enjoyed chart success in the late 1980s with their pop/punk sound. James, the lead singer and focal-point of the group, attracted media attention with her sexually charged and rebellious image. D:Ream is a Northern Irish pop rock and dance group. They had a UK #1 hit with "Things Can Only Get Better" in 1994 as well as eight more top 40 hits. They released two albums, both of which reached the UK top five. The group had an all-male line-up which varied in number, but mainly centred on lead singer Peter Cunnah. 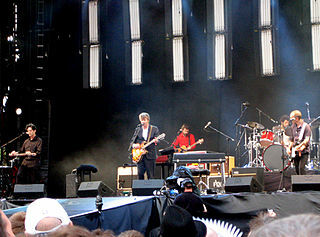 The live band included keyboard player Brian Cox, who is now a professor of physics and a television presenter; although Cunnah, as the only official member, normally played keyboards on studio recordings. Andrew Roachford is a British singer-songwriter and the main force behind the band Roachford, who scored their first success in 1989 with the hits "Cuddly Toy" and "Family Man". He has also had a successful solo career. This is the discography documenting the albums and singles released by Martika and the Oppera band in which she sings. The discography of INXS, an Australian rock band, consists of 12 studio albums, 62 singles, 12 compilation albums, 4 live albums and 5 extended plays. "She Drives Me Crazy" is a song released in 1988 by English group Fine Young Cannibals, and included on their 1989 album The Raw & the Cooked. Peaking at No. 5 on the British singles chart in January 1989, "She Drives Me Crazy" is the band's highest charting single in their native UK. The single proved an even bigger hit in the US, topping the Billboard Hot 100 on 15 April 1989, and becoming the first of two chart-topping singles for the band on this chart. "She Drives Me Crazy" also reached No.1 on the US Billboard Hot Dance Music/Club Play Singles chart, as well as in countries including Australia, Austria, Canada, New Zealand and Spain. It reached the top 3 on several European charts including Belgium, Germany, Iceland, Ireland and Switzerland. This article lists the discography of the British girl group Bananarama. Laura Branigan was an American singer and songwriter. Her discography consists of seven studio albums, six compilation albums, 21 singles, three video albums and 14 music videos. This is a discography for the rock band Crowded House. "I'm Not the Man I Used to Be" is a song by British pop-rock band Fine Young Cannibals. It was released as the fourth single from the band's 1988 album The Raw & the Cooked. The song reached the top 40 charts in the United Kingdom, Canada, Austria, and the Netherlands. It also appeared on the CD version of the compilation album Now 16. The discography of Icehouse, an Australian rock, synthpop band includes releases under the earlier band name, Flowers, which was formed in 1977 by the mainstay Iva Davies, and was renamed Icehouse in 1981; material was also released by "Iva Davies and Icehouse". Flowers or Icehouse have released nine major studio albums, as well as four remix albums, thirty-nine singles and twenty-six music videos. Icehouse and/or Iva Davies have also issued two film soundtracks and contributed to ballet scores. Interactive is a German electronic music group, founded in 1990. They are best known for their 1992 single "Who Is Elvis" which reached No. 12 in Germany, and for their 1994 cover version of Alphaville's, "Forever Young", which reached No. 7 in Germany, also making the top 20 in several other countries. Interactive released two studio albums, Intercollection in 1991 and Touché in 1995. Their last released work was the 1998 single Fanatic. In 2002, Kosmonova remixed their version of Forever Young. The Raw & the Remix is a remix album by English alternative band Fine Young Cannibals, released in 1990 by I.R.S. Records, MCA Records and London Records. It contains remixes and alternate versions of songs by the band, mostly from their 1989 album The Raw & the Cooked. Several of the remixes were created by David Steele and Andy Cox of the band, whilst others were created by disc jockeys such as Smith & Mighty, Youth, Jazzie B, Nellee Hooper and Derrick May. The remixes on the album are said to be significantly different from the originals, some of which contain major stylistic differences in the arrangements. The discography of Sade, an English band formed in London in 1982, consists of six studio albums, two compilation albums, one live albums, two EPs, 23 singles, five video albums, and 20 music videos. Following a brief stint of studying fashion design and modelling, Sade Adu began back up singing for a band named Pride, during this time she attracted attention from record labels and along with other members left Pride and formed Sade. Following a record deal Sade and her eponymous band released their debut album Diamond Life (1984), the album was a commercial success and sold over six million copies, becoming one of the top-selling debut recordings of the 1980s and the best-selling debut ever by a British female vocalist. 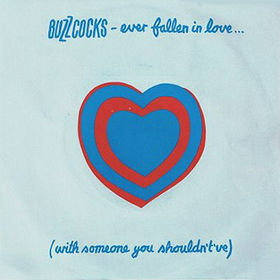 "Ever Fallen in Love " is a 1978 song written by Pete Shelley and performed by his group Buzzcocks. It was a number 12 hit on the UK Singles Chart and was included on the album Love Bites. The following is a comprehensive list of music records released by Neneh Cherry, including her works recorded in collaboration with the CirKus band. The discography of Robert Palmer consists of fourteen studio albums, three live albums and eleven compilation albums. 1 2 3 4 Strong, Martin C. (2000). The Great Rock Discography (5th ed.). Edinburgh: Mojo Books. pp. 343–344. ISBN 1-84195-017-3. ↑ Jessica Berens (April 1986). "Fine Young Cannibals – They're England's latest sultans of soul. Soon they'll be bringing it on home to America, where at least a band can get a decent meal". Spin Magazine . p. 73. Retrieved 11 September 2010. ↑ O'Callaghan, Mary Anne (6 March 1989). "Cannibals has single cooking". Kentucky New Era. p. 7B. Retrieved 10 January 2018. ↑ Gerard, Chris (February 11, 2014). "Classic album revisited: Fine Young Cannibals "The Raw and The Cooked"". Metro Weekly . ↑ "Official Charts > Two Men, a Drum Machine & a Trumpet". The Official UK Charts Company. Retrieved 27 July 2018. 1 2 3 4 Roberts, David (2006). British Hit Singles & Albums (19th ed.). London: Guinness World Records Limited. p. 200. ISBN 1-904994-10-5. 1 2 3 4 "Official Charts > Fine Young Cannibals". The Official UK Charts Company . Retrieved 27 July 2018. Top 100 (Kent Music Report) peaks to 12 June 1988: Kent, David (1993). Australian Chart Book 1970-1992 (Illustrated ed.). St Ives, NSW, Australia: Australian Chart Book. p. 111. ISBN 0-646-11917-6. N.B. The Kent Music Report chart was licensed by ARIA between mid-1983 and 12 June 1988. Top 50 (ARIA) peaks from 13 June 1988: "australian-charts.com > Fine Young Cannibals in Australian Charts". Hung Medien. Retrieved 27 July 2018. Top 100 (ARIA) peaks from January 1990 to December 2010: Ryan, Gavin (2011). Australia's Music Charts 1988–2010 (pdf ed.). Mt. Martha, VIC, Australia: Moonlight Publishing. p. 103. "I'm Not the Man I Used to Be" (ARIA) peak: Scott, Gavin. "This Week In 1990: February 4, 1990". blogspot.com. Retrieved 2 February 2019. "I'm Not Satisfied" and "It's OK (It's Alright)" (ARIA) peaks: "Response from ARIA re: chart inquiry, received 5 June 2015". Imgur.com. Archived from the original on 5 June 2015. Retrieved 16 June 2015. All ARIA-era chart peaks to 18 August 2018: "Response from ARIA re: Fine Young Cannibals ARIA chart history, received 18 August 2018". Imgur.com. Retrieved 2 February 2019. N.B. The High Point number in the NAT column indicates the release's peak on the national chart. 1 2 Steffen Hung. "Austria Top 40 – Hitparade Österreich". austriancharts.at. Retrieved 30 October 2010. ↑ "Results – RPM – Library and Archives Canada". Collectionscanada.gc.ca. Retrieved 30 October 2010. Fine Young Cannibals: "Fine Young Cannibals – Fine Young Cannibals (album)" (in German). GfK Entertainment. Retrieved 27 July 2018. 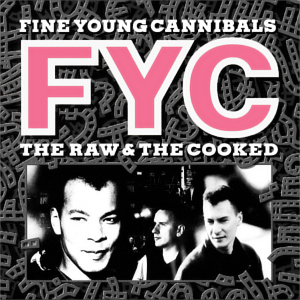 The Raw & the Cooked: "Fine Young Cannibals – The Raw & the Cooked (album)" (in German). GfK Entertainment. Retrieved 27 July 2018. The Raw & the Remix: "Fine Young Cannibals – The Raw & the Remix (album)" (in German). GfK Entertainment. Retrieved 27 July 2018. The Finest: "Fine Young Cannibals – The Finest (album)" (in German). GfK Entertainment. Retrieved 27 July 2018. "Johnny Come Home": "Fine Young Cannibals – Johnny Come Home (single)" (in German). GfK Entertainment. Retrieved 27 July 2018. "Suspicious Minds": "Fine Young Cannibals – Suspicious Minds (single)" (in German). GfK Entertainment. Retrieved 27 July 2018. "Ever Fallen in Love": "Fine Young Cannibals – Ever Fallen in Love (single)" (in German). GfK Entertainment. Retrieved 27 July 2018. "She Drives Me Crazy": "Fine Young Cannibals – She Drives Me Crazy (single)" (in German). GfK Entertainment. Retrieved 27 July 2018. "Good Thing": "Fine Young Cannibals – Good Thing (single)" (in German). GfK Entertainment. Retrieved 27 July 2018. "Don't Look Back": "Fine Young Cannibals – Don't Look Back (single)" (in German). GfK Entertainment. Retrieved 27 July 2018. "I'm Not the Man I Used to Be": "Fine Young Cannibals – I'm Not the Man I Used to Be (single)" (in German). GfK Entertainment. Retrieved 27 July 2018. "I'm Not Satisfied": "Fine Young Cannibals – I'm Not Satisfied (single)" (in German). GfK Entertainment. Retrieved 27 July 2018. "It's OK (It's Alright)": "Fine Young Cannibals – It's OK (It's Alright) (single)" (in German). GfK Entertainment. Retrieved 27 July 2018. "The Flame": "Fine Young Cannibals – The Flame (single)" (in German). GfK Entertainment. Retrieved 27 July 2018. 1 2 3 "charts.org.nz > Fine Young Cannibals in New Zealand Charts". Hung Medien. Retrieved 27 July 2018. ↑ Steffen Hung. "Norwegian charts portal". norwegiancharts.com. Retrieved 30 October 2010. ↑ Steffen Hung (22 February 1989). "Swedish Charts Portal". swedishcharts.com. Retrieved 30 October 2010. ↑ Steffen Hung. "Die Offizielle Schweizer Hitparade und Music Community". Hitparade.ch. Retrieved 30 October 2010. ↑ "Fine Young Cannibals > Chart History > Billboard 200". Billboard . Retrieved 27 July 2018. 1 2 "Canadian Recording Industry Association (CRIA): Gold & Platinum". Cria.ca. Archived from the original on 1 May 2010. Retrieved 30 October 2010. ↑ "Response from ARIA re: Fine Young Cannibals ARIA chart history, received 18 August 2018". Imgur.com. Retrieved 2 February 2019. ↑ "Recording Industry Association of America". RIAA. Archived from the original on 25 February 2013. Retrieved 17 August 2011. ↑ "Ultratop Belgian Charts". ultratop.be. 24 October 2010. Retrieved 30 October 2010. ↑ "Ultratop Belgian Charts". ultratop.be. Retrieved 2015-12-28. ↑ "Results - RPM - Library and Archives Canada". Collectionscanada.gc.ca. Retrieved 2015-12-28. ↑ "The Irish Singles Charts – All there is to know > Search results for Fine Young Cannibals" . Retrieved 2019-02-02. ↑ "Fine Young Cannibals | Top 40-artiesten". Top40.nl. Retrieved 2015-12-28. ↑ "Fine Young Cannibals > Chart History > Hot 100". Billboard. Retrieved 27 July 2018. ↑ "Fine Young Cannibals > Chart History > Dance Club Songs". Billboard. Retrieved 27 July 2018. "I'm Not the Man I Used to Be"